During this election campaign period, the Conservatives keep drumming out ‘tough on crime’ rhetoric that flies in the face of research, reports and basic common sense. Crime rates have steadily declined over the last 20 years and yet so many candidates in this election keep emphasizing how they are going to fight crime and get tough on criminals. Even if crime was they kind of large-scale problem they would like us to believe, certainly it would make sense to implement practices that have been proven to actually lower crime rates. But no, our government seems intent on building more prisons and filling them with more people – even though incarceration is not as effective in lowering crime rates and recidivism compared with prevention, treatment, and community-led programs. 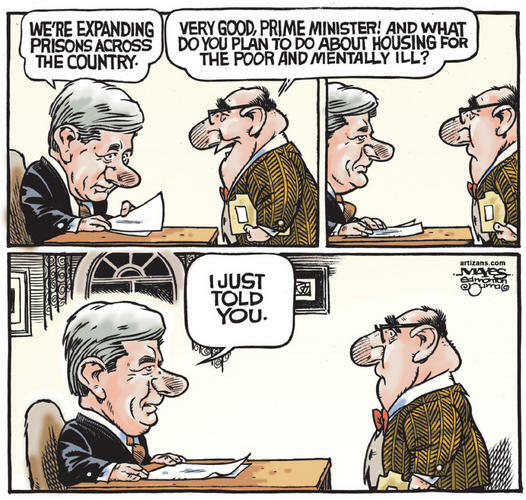 Corrections Canada currently spends just over $2,200,000,000 a year on prisons. And now there are plans to build 2,700 additional prison beds at a cost of $2,100,000,000 ($800,000 per bed). This makes no sense and Canadians should be outraged. Be even more outraged when you look more closely at who exactly we are spending these billions of dollars on to warehouse in prisons. 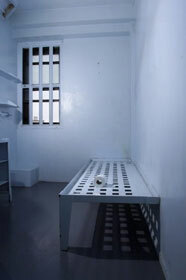 In provincial jails, close to 60% of the people in prison have not even been convicted – they are awaiting trial and may be found innocent or guilty of a crime not deserving jail. We keep clogging up the system with more people and paying $100,000 to $200,000 a year to keep them in jail while they wait. So much for due process or innocent until proven guilty. Kim Pate of the Canadian Association of Elizabeth Fry Societies points out that over 80% of women in prison are incarcerated for poverty-related offences. Additionally, 82% of women who are federally sentenced in Canada have experienced physical or sexual abuse, 75% have less than a junior high school education, 34% are Indigenous, and the majority live with mental health issues. It would be wonderful if during this election campaign Canadians challenged their local candidates and party leaders to present strategies for actually fixing our justice system. I’ve been looking a lot at the Canadian justice system and have been frustrated by our government’s stubborn commitment to pursue agendas that may sound good to voters but are destructive for the people directly affected. So it was refreshing and encouraging today to learn about a great program that is actively doing positive things for prisoners. Stride is a program within Kitchener-Waterloo’s Community Justice Initiative which supports federally sentenced women coming out of the Grand Valley prison into the KW community. They use community engagement and circles of support to provide care and support for women who face so many obstacles when leaving prison and trying to build a new life for themselves. Most women in prison, and those who are coming out of prison, are isolated and stigmatized. The vast majority have been physically and/or sexually abused. Most were unemployed at the time of their offence; two-thirds have not completed high school. 85% of incarcerated women are mothers. It is naive and unrealistic to expect that these women can leave the harsh prison environment and seamlessly integrate into communities. Stride matches trained community volunteers with women wanting support with re-entering the community. By having community support and caring volunteers encircling them, women have a much better chance of not only staying crime-free, but also improving their lives. One aspect of the program which is really interesting is called the ‘Stride Night Program’ in which community volunteers and local agencies go inside the prison walls to participate in evenings of crafts, sports, games and socializing. These evenings provide opportunities for inmates and community members to build relationships that can be so important and helpful for women’s community integration. For anyone near Kitchener, I encourage you to check out RareFunk, a consignment store in the downtown that supports the female inmates by selling ‘Fresh Start Creations’ – the crafts and art which female inmates create. Through the proceeds from these sales, these women are able to give back to the KW region by donating to local women’s or children’s charities. The more I learn about the backward policies our government has been advocating, such as building more prisons while reducing services and programs that actually rehabilitate and assist offenders, the more frustrated I become. The Conservative government was recently found in contempt of Parliament (something unprecedented in Canadian history) in part for failing to disclose the full cost of their ‘tough-on-crime’ agenda. They have already acknowledged that they will spend an estimated $6 billion in construction costs alone for new prisons, but what we don’t know is the real total which will be spent on incarcerating and warehousing all the new convicts. Budgets for prison infrastructure have already more than doubled in five years (from $88.6-million in 2005–6 to $211.6-million in 2010–11). To make sure these prisons are filled, the Conservatives are changing the Criminal Code to increase mandatory minimal sentences and remove the discretionary powers of judges who might recognize that an offender is not actually a threat to the community and that the interests of all parties – victims, community and offender – are best served by using alternatives to prison such as reparation, restitution and treatment. Yet while this election was brought about by issues of contempt and spending on prisons, these issues have all but disappeared from the media. Should you encounter any candidate in the next few weeks, or have a chance to ask questions which may be put before political parties, you may want to remind candidates about what triggered this election and ask if our tax dollars will continue to be dumped into ineffective, pricey ‘tough-on-crime’ agendas. You could mention that more than a third of prisoners in provincial jails have not even been convicted of a crime – they are awaiting trial. The majority of our inmates are serving a sentence for a non-violent offence (78% and 31% in provincial and federal penitentiaries respectively). Many repeat offenders are mentally ill – they require treatment, health services, education, housing and employment. Ask for real improvements to our justice system, not simply more prisons.